Against seemingly high odds Ryan Cavalieri has successfully defended his Reedy Race of Champions title by a single point over Associated team-mate Ryan Maifield. 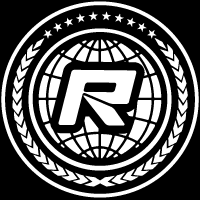 The victory at the 20th running of the world famous race makes Cavalieri its most successful champion, this being the 4-time World Champion’s third time to beat the best offroad drivers in the world in the unique heads up racing event that was created by industry pioneer Mike Reedy. The podium at OCRC Raceway, which rose to the challenge of hosting the great race for the first time, was completed by HB’s Ty Tessmann. Going into the final round of racing, the 30 invitational drivers having already done 11 races each over 3-days, it was advantage Maifield. Topping the 2WD action, holding a 2-point lead in the standings at the end of the 6 rounds, the Arizona ace needed just a fifth or higher in his final 4WD heat to claim the overall win. Racing in the first of the heats that made up the concluding round, things looked on track as from last on the grid Maifield worked his way up to fifth. With a minute to go Maifield’s first ever Reedy Race title would slip away as he rolled his Reedy powered B44.2 allowing Dakotah Phend to demote him to sixth. Although Cavalieri still needed to win his heat, a dejected Maifield knew the title had slipped through his hands. 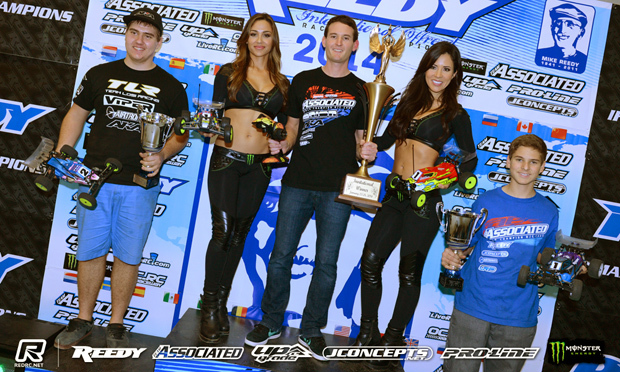 Starting the last race of the 2013 Reedy Race from 3rd on the grid, bided his time go to the front on lap 5. Once there he cruised to an 8-second victory over Rob Gillespie to secure an impressive third title as well as being only the 2nd driver to ever defend the title. 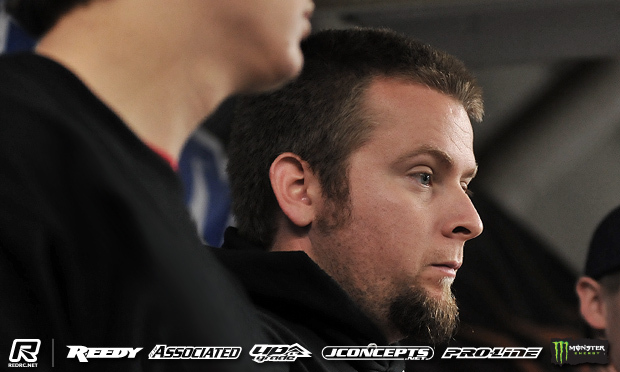 The only other driver to do this being his boss, Team Associated Vice President Cliff Lett. Commenting on his history making win, Cavalieri said having watched the first heat ‘go down’ he ‘couldn’t believe what he was seeing’. Although one of his easiest heats of the event, he said knowing that he needed the win for the overall victory and having just witnessed how easily it could go wrong he said the start was ‘a little stressful’ as he felt the pressure of knowing he needed to win. Describing the race as ‘one of the toughest ones to win’, he said this one was ‘special’ and as an event this was one of the ‘most fun’ he has contested. While the world’s attention was on the invite class, in the open class Maifield’s protege & rising young star Spencer Rivkin won 4WD to book himself a place in the 21st Reedy Race of Champions. 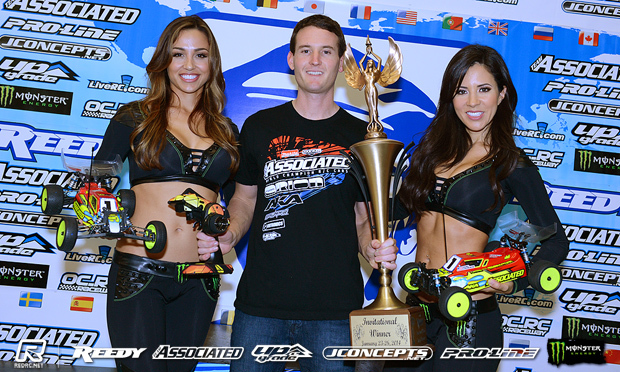 Also booking his place in next year’s main event by winning 2WD was TLR driver JP Richards. 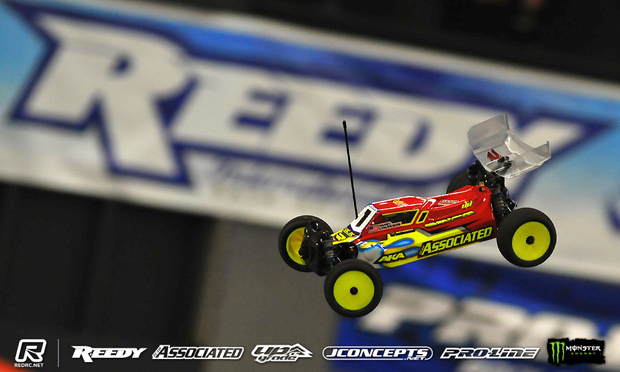 View the complete Reedy Race of Champions event heat listing here (PDF).